The Amtech Converting Tag Manager provides your plant with the real-time ability to print both work-in-process and finished good load tags at machine centers. The system works in combination with the Machine Monitoring Application. The main screen displays a list of the jobs currently in the order queue as well as detailed information for each job. The Converting Tag Manager responds to an “action” taken by the operator that notifies the application to print the proper load tag. The exact “action” is based on the machine center and corresponds to the discharge of the unit from the machine. Using this method, the Converting Tag Manager prints the “next” tag that will be used by the operator. In effect, the printer will always have the “next” tag waiting in the printer. For the last tag of the order, or when the order only has a single unit, the operator edits the “last” tag and then reprints the tag to reconcile the actual quantity in the unit. If the count is accurate no action is required from the user. Provides the ability to print Work-in-Process and Finished Goods load tags at machine centers. Accommodates an unlimited number of load tag formats to meet Plant and Customer requirements. Information can be presented in any combination of alphanumeric, embedded graphics and Code 39 (3 of 9), Code 128 or I 2 of 5 bar code formats. Eliminates need to prepare, handle and control batches of tags. Minimizes possibility that a unit will be marked with incorrect tag. Allows finished units to be re-stacked and load tags corrected. Includes capability to produce duplicate tags if one is missing. 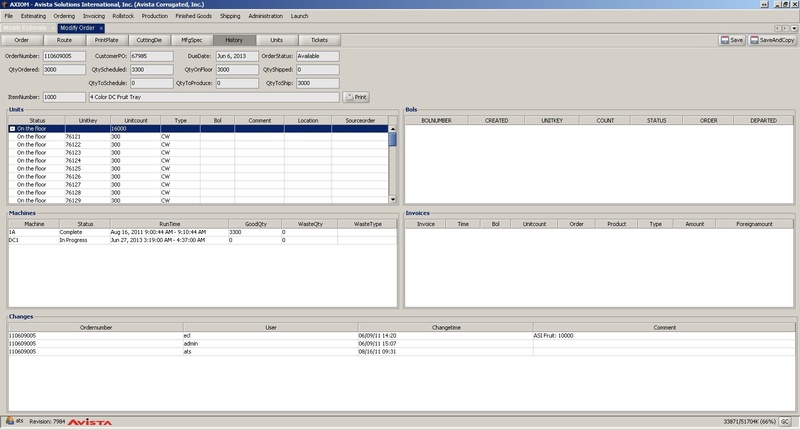 Provides a control record for downstream operations, including shipping. Formatted load tags improve the appearance of outgoing loads and enhances the Plant’s reputation for quality and service. Order history is also available allowing you to review old order information and reprint tags. Using the system, Operators may edit tags that were produced. Using the Edit Units Screen, an operator can add new units to the order, delete units from the database, join multiple units into one unit, split units, change the unit count and print tags. A work center view is available that displays each machine number and the corresponding description of the machine. As a stand-alone application, Converting Tag Manager can be used without the Machine Monitoring – Plant Floor Application. This allows for multiple workstations running the Converting Tag Manager application to print to a shared printer or allows multiple work centers to share a single workstation computer. In this configuration, the user will have the ability to select the work center and order that is being worked on to print the proper tags. Automatically create tags as the loads are being built.